Modi had congratulated Sharif on the wedding of his granddaughter and also presented him gifts. Modi\'s recent trip to Pakistan on Sharif\'s birthday had raised many eyebrows. 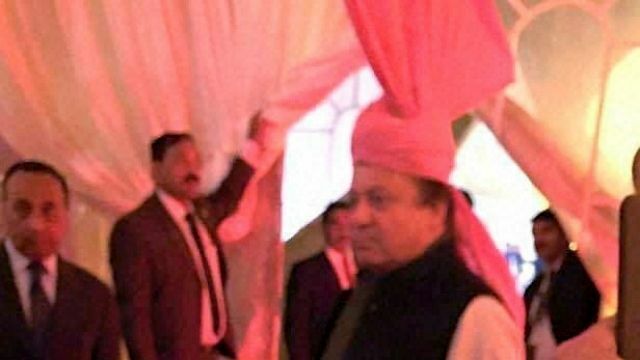 A source at Sharif's Jati Umrah residence told PTI that Sharif had donned the "Indian Rajasthani pink turban" gifted to him by Modi during the Indian premier's visit on Friday. "Wearing the gifted turban of Mr Modi itself shows that Mr Sharif's sincere intention towards the neighbouring country." Besides, it also demonstrates that Mr Sharif values the gift of Mr Modi," the PML-N source said. Also read: Why is Sajjan Jindal fixing Modi and Sharif's foreign policy meetings? Mehrun Nisa, daughter of Maryam Nawaz, married Raheel Munir, son of well known industrialist Chaudhry Munir, who was the first to shake hands with Modi when he got off the car at Jati Umrah outside Lahore on Friday evening. Modi had congratulated Sharif on the wedding of his granddaughter and also presented him gifts. Today evening around 2,000 guests attended the Walima ceremony of the couple. Some VVIP guests had also come from Saudi Arabia for the occasion. Both the groom and the bride have studied at the London School of Economics. The source say that Walima ceremonies will also be held in UAE and the UK next month because many friends of the Sharifs could not make it to Lahore. Though all the wedding ceremonies are being kept a close family affair away from the public eye, selected footage is released to the media like during the marriage of Sharif's elder son Husain back in the 1990s. The locals as well as British tailors have reportedly been hired to prepare dresses of the bride and her relatives.